I recently read a couple of picture books that may be of interest to you if you know any young boys who are just learning to read and who like trucks (and don't they all?). The first is My Big Rig, written by Jonathan London and illustrated by Viviana Garofoli. This study picture book from Marshall Cavendish Publishers tells the imagined story of a young boy who drives his "big rig" across the country. He goes over bridges and through tunnels, stops at truckstops, and drives through the night. He starts out at the Golden Gate Bridge, and then sees desert, plains, and forest along the way to the East Coast docks. The text is simple, averaging less than 10 words per page, and I think that the book could serve as an early reader for young truck fans. There's also a bit of a Where the Wild Things Are homage, as the boy leaves his fantasies at the end just in time for dinner (and, in a slightly modern twist, his dad, instead of his mom, calls him to dinner). Garofoli's computer-generated illustrations have a playful, graphic artist feel to them. The boy has a perfectly round head, for example, and the fields are indicated using textile patterns. The words sometimes curve to fit in with the pictures -- for example, as the truck goes up a mountain. The bright yellow truck is sure to be irresistible to preschool boys, and matches the end pages of the book. What's also irresistible is that the boy has a big smile on his face on every page. It's not a complex story, but it's very likable. I recommend it as a gift for young boys just thinking about learning to read. My Big Rig is a companion volume to Firefighters: Speeding! Spraying! Saving!, also published by Marshall Cavendish and illustrated by Viviana Garofoli. That title was written by Patricia Hubbell. The illustrations are of similar quality, but I wasn't able to spend as much time with the story. The other book that I have for boys is an early reader / picture book called The New Blue Tractor. Written by Stacey Gabel and illustrated by Richard Neuman, this is a self-published title produced by Dog Ear Publishing. 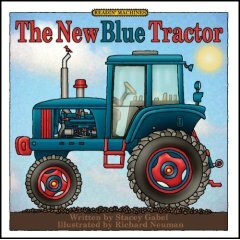 The New Blue Tractor is the first of a projected series of early readers set on a farm. It was inspired by the author's son's fascination with tractors. Each page shows a different activity that a tractor undertakes throughout the year, from plowing the fields to towing the corn to getting washed to plowing snow. The text is very simple and repetitive: "The tractor gets hooked to the plow. The tractor helps plow the field. ", etc. There's not really a story to it, more a series of facts about what tractors are used for during different parts of the year. Neuman's professional, detailed illustrations fill the majority of each page, with the tractor always prominently displayed. The book's user-friendly website says that he uses "traditional media combined with digital technology to provide artwork ready for use in printing." I'm not sure what that means, exactly, but he uses lots of primary colors (the tractor is blue with red trim), and combines realistic detail (the gears of the tractor) with occasional dashes of whimsy (a snowman waving at the tractor driver). Despite the modern techniques, the illustrations have a bit of an old-fashioned feel to them, especially a picture of the barn in the snow. Personally, I'd like to see future books in the series have a bit more of a story to them, but perhaps I'm reflecting my own bias in favor of story over straight facts. In any case, this small book (paperback, 24 pages) would make a nice addition to the library of your tractor-obsessed developing reader. Of course there are lots of truck and tractor books out there. But there does seem to be an insatiable demand for them among preschool boys. These two titles are both newly published and engagingly illustrated. Either book would be suitable for read-aloud or for beginning readers. But keep them for the truck and tractor fans - they are unlikely to please kids looking for fairy stories.